Mopp vs Hassle.com: Which is the best home cleaning service? You are here: Home / House + Home / Mopp vs Hassle.com: Which is the best home cleaning service? It’s the start of the cleaning wars! This may not mean much to you but if, like me, you live in a rental property that’s so white even the stairs are painted white –with a TODDLER – then you’ll be excited to know that home cleaning is getting a digital makeover. In the last couple of years both TaskRabbit and Homejoy have launched in the UK to complement local Brit businesses Mopp and Hassle.com. Which one is better though? This former housekeeper decided to find out. How has home cleaning become digitized? 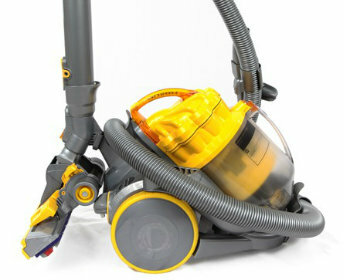 You might think that digitizing the domestic cleaning business stopped with robot vacuum cleaners – not so. Both Mopp and Hassle.com work like virtual cleaning agencies helping you find, book, and pay cleaners for both one-off and regular cleaning gigs. Both companies have super easy websites and apps to do this meaning that now only analogue losers have to drive to the Tesco ATM at midnight to get cash out for the cleaner the next day. Brooks and Dowd conceived of the idea for Mopp after trying to find a cleaner following a large house party. (I get the sense Brooks & Dowds weren’t living in the kind of shared housing I experienced in my 20s). Similarly, Coleman, was struggling to find a piano teacher online. Wait! What? Here’s the core difference – Hassle.com wants to be some sort of Match.com for all sorts of services; carers, tutors, personal trainers etc. After launching with 27 different services they are currently focussing on cleaners only. 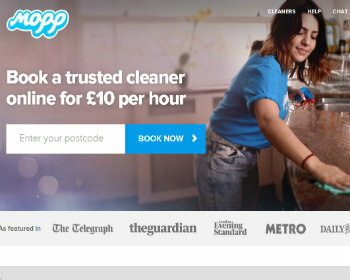 Whereas Mopp just wants to be “the best cleaning company…”. Despite my huge admiration for Coleman who learned Ruby on Rails in six weeks to build the first version of Hassle.com I personally prefer businesses who just focus on doing one thing really, really well. Here’s the biggie – how well did they clean? Both were good but left me with doubts. It’s what happened next that really differentiated the two. Both asked for feedback after the clean but Mopp’s email form was the cleverest bit of psychological trickery I’ve ever seen – asking me to rate my cleaner on whether I’d recommend her to a friend. I selected the diplomatic 8/10 ‘Undecided’ rating. Hassle.com asked me outright to rate the cleaner herself. Unable to live with myself for destroying a woman’s livelihood over one house clean I dithered. Then I became irritated with having to sign-in to the site before I could complete the feedback form. It’s a small thing but not exactly hassle-free. The ‘Undecided’ response triggered a call from Mopp’s people who took some more details and reassured me this process was helpful for both cleaners and clients to get the best possible service. Hassle.com also put a call in to me which I missed. They didn’t leave a name or contact number, or send an email asking me to follow up with more info. I have to confess I couldn’t be bothered chasing them down. More hassle, right? 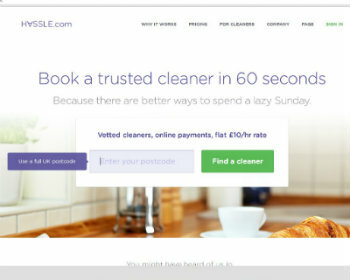 So, I did what anyone would do – I sent a friend a discount voucher for Hassle.com and encouraged them to book a clean. They also found their clean with Hassle.com a little sub-par but things got really exciting when the cleaner took a complaint call in front of him, WHILE CLEANING HIS HOUSE. We were both left with the sense that Mopp has quality control sorted while Hassle.com still has some work to do there. 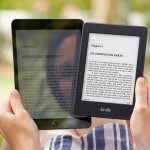 Both companies have successfully used digital technology to make an industry smarter. But I also like that they’ve helped define a fair market rate for cleaning – £10 p/hour – that is beneficial to the clients and the cleaners. Mopp sent me case study info on how their cleaners love the service. Even though Mopp takes a cut of their earnings, many of the cleaners feel they get paid better, and hired more often, through being with Mopp. I can deal with my middle-class guilt when using services like Mopp and Hassle.com because they enable fair and legal work for people who are often pressured to take cr*ppy cash-in-hand jobs to support themselves. 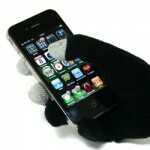 Hassle.com is good, it pretty much works, it will do even more in future. I just feel that Mopp ultimately achieves more with regards to connecting customers with quality cleaners. I now use Mopp.com for a regular weekly clean. The first time in my life I’ve ever done so. Win! The High Priestess of Social Media in the UK, and a big lifehack nerd. If there’s a tool out there for making life easier, Darika has already signed up, logged in, and taken the “Darika” username. I worked for over 50 hassle.com clients for 4 months this year. I was treated like dirt by the non-agency they like to call themselves, because of a few clients lying about me and refusing to pay. In the end I texted the last one to express my feelings about his utter lies and accusations, mentioning I would get in disrepute with hassle because of his accusations. He contacted them and accused me of harassing him. They then decided to refuse me any paye AND cancel all my regular clients. The client had obviously no evidence to back his claim up, but they did everything in their power to act as his spokespersons/ lawyers. I had worked 4 hours instead of 3, without claiming any money for the extra time. The house was filthy and the bathroom tub and sink black with grime. The dog had left hair all over the house and the sofa. I took one whole hour to brush just the latter. There was no Hoover. I had to brush everywhere with a dustpan and brush. The clients were lying in the sun in the back garden whilst I slaved away for 4 hours. He complained that I had been late (bold lie), he claimed I had not done the dishes ( all filthy pans and dishes stinking of putrefaction washed by hand and put away) and that there was dog hair everywhere. The hassle people backed him up and refused to pay me, cancelled all my clients as some sort of sick vendetta. Another thing they do is encourage new customers to book regular shifts, then charge the cleaner £15 straight away! Meaning the worker gets paid £1.90/hour for the first two hours he/ she does on a new job, without any guarantee that there will even be any further booking with the client at all. Disgusting. Absolutely disgusting. Wanted to post about the absolutely terrible customer service provided by Hassle.com. I got trapped into a 3 month contract by them (they do not mention its a contract on the main page while you are booking, but wrap it up in the detailed terms and conditions). They sent a cleaner who had no experience, and provided horrible service. She did not clear out the garbage (in fact she stuffed loose rubbish in the bin which I had to pick up with my hands since it was outside the rubbish bag), broke the toilet seat and left behind dust and stains all over. Now when I wish to cancel all my cleanings through Hassle.com, they want to charge me an exorbitant £60 cancellation fee. This company is running a scam – with customer cancellations as a revenue stream, rather than customer orders. I recommend anyone thinking of trying their services, or investing in them in future, to stay away!! !